Trust for America’s Health held a convening, funded by The John A. Hartford Foundation, called A Public Health Framework to Support the Improvement of the Health and Well-Being of Older Adults, in Tampa, Florida, on October 27, 2017. National, state, and local public health officials, aging experts, advocates, service providers and health care officials came together to discuss how public health could contribute to an age-friendly society and improve the health and well-being of older Americans. The goal of the convening was to develop a public health framework to support the improvement of the health and well-being of older adults, focusing on areas where public health can support, complement, or enhance aging services. 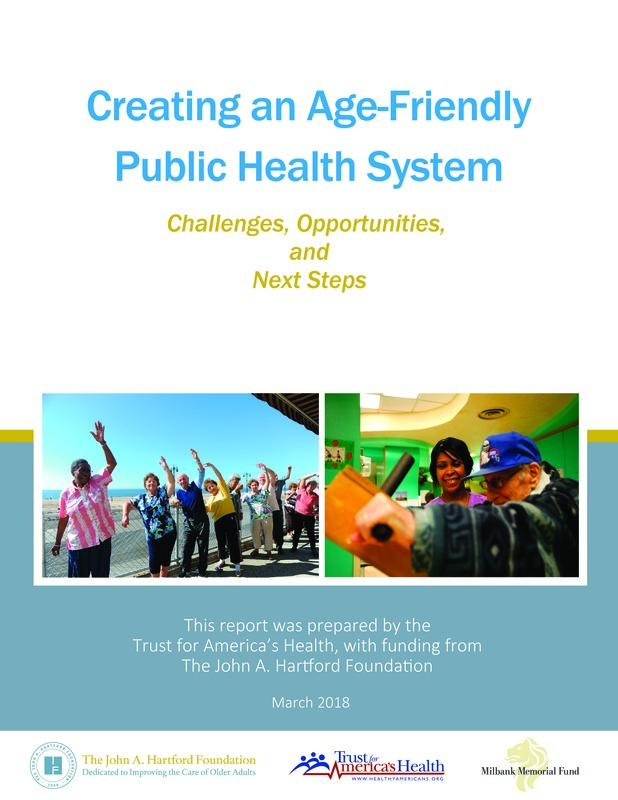 The preliminary Framework for an Age-Friendly Public Health System described in the report outlines the functions that public health can fulfill, in collaboration with aging services, to address the challenges and opportunities of an aging society. The main takeaway from the convening was the need for an age-friendly public health system that recognizes aging as a core public health issue.